Tory leadership contenders are awaiting the results of the first knock-out vote by the party's 198 MPs. David Cameron, Ken Clarke, David Davis and Liam Fox faced the ballot, having made their final pitches in hustings on Monday night. The man with fewest votes is eliminated with Thursday's second ballot selecting the two candidates who will be put forward to all party members. 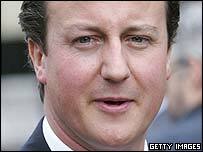 Mr Cameron is favourite but the other three men say they remain confident. The ballot closed at 1700 BST, with the result expected shortly after 1730 BST. Latest estimates are that Mr Davis has the declared support of 66 MPs, Mr Cameron of 38, Mr Clarke of 25 and Dr Fox of 23. About 40 Tory MPs did not declare how they intended to vote in the secret ballot. If the MPs vote as they have declared, Mr Davis would be guaranteed to make it to the run off - leaving the other three to battle for one spot. Labour Home Secretary Charles Clarke said the Conservative Party would be "absolutely foolish" if it denied Ken Clarke, the former chancellor, the chance to get through to the nationwide vote. He described him as "the biggest challenge to Labour in the centre ground of British politics". At a hustings on Monday, organised by the 1922 Committee of backbenchers, each contender delivered a five-minute address, before fielding questions for 15 minutes. Dr Fox, the first candidate to address MPs, said as he left: "The Tory party will not begin to ever recover properly until we have an intellectual renaissance. "While the front bench must be bound by collective responsibility, backbenchers must be given the freedom to roam." Mr Clarke said he believed there would be "a great deal of ill-feeling" if he did not make the final round. "I don't think I will be first out - I actually sense that what the membership want is David Cameron and myself to go forward at the end," he said. Mr Davis reported a "very friendly response" from MPs, adding that Mr Clarke might be "disappointed" over his stated wish for a final run-off against Mr Cameron. Mr Cameron, who has repeatedly refused to answer questions about whether he had used drugs as a student, said MPs had not asked him about the issue. He said he thought his message had "gone down well". An ICM poll for BBC's Newsnight suggested it would make no difference to two-thirds of voters (66%) if the leader of the Conservatives had used cocaine at some point in the past. The survey suggests that 28% of voters would be less likely to vote Conservative if they knew the party leader had used the drug.